In all other circumstances whereby a prepayment % has been agreed to by both parties and paid at time of booking, the prepayment is non-refundable. Any outstanding balances due for the reservation shall be paid 1 month prior to arrival. We encourage guests to take an insurance to cover them in case they cannot travel. Any damages and breakages during clients’ stay will be charged. A refundable damage deposit of €250 is required at arrival and refunded prior to departure together with a passport copy. We may ask for your credit card details on arrival as a security in case of damages. An inventory is available to confirm the cost of an item. Should an item not be present on the inventory for any reason whatsoever, the cost of its closest replacement will be charged. This new 2 bedroom apartment with sea views is served with elevator and has been highly finished to exacting standards. Situated in an elegant block over looking Mellieha valley with 180 degree views of Mellieha village core. It enjoys stunning side sea views and promises a perfect holiday stay. 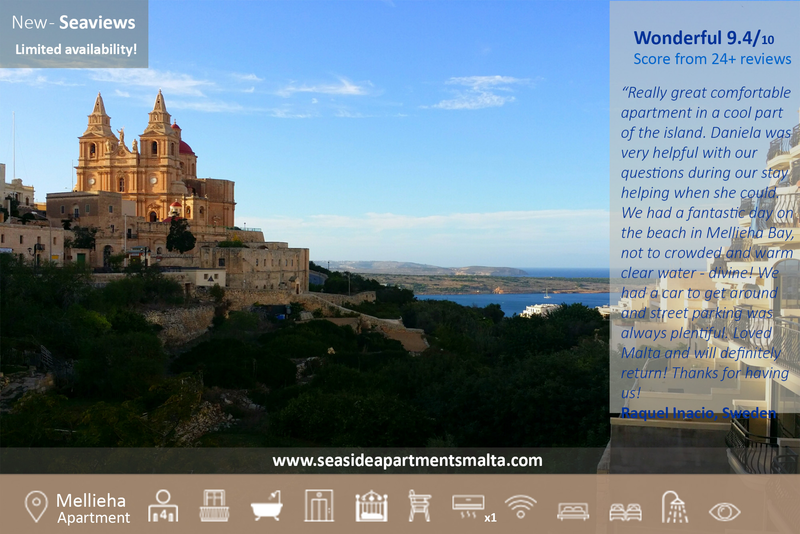 It is 100 meters from the bus stop and 5 min drive to Mellieha bay. 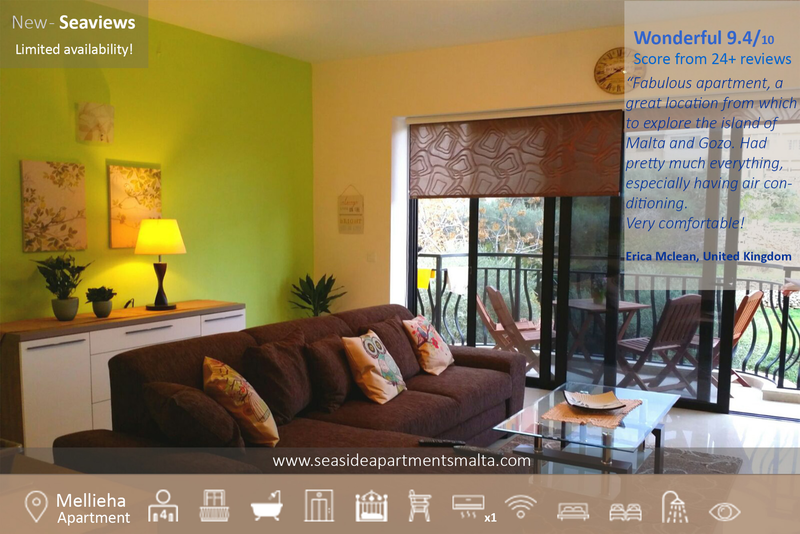 It has a spacious living room overlooking the valley and Mellieha Cathedral with adjacent fully equipped kitchen. The wide balcony enjoys sunlight throughout the day. A pair of roman blinds enables you to block the light should you wish so. The Italian kitchen has been beautifully tailored to the property enabling you to enjoy cooking fresh local specialties while overseeing the valley. It is fully equipped. Tea, coffee, sugar and water are also provided. The main bedroom is located at the rear part of the apartment and is served with an en suite shower and toilet. Adjacent to the main bedroom is the spare bedroom, lightly decorated in pistachio colour also enjoying distant valley views. The main bathroom has a bath with shower and is beautifully finished in marble. All towels are provided as well as hand soap. Hi speed WIFI internet is included together with cable television and kids channels. A baby bed is also available. Prepayment: No prepayment needed. Credit Card preauthorised atleast 30 days prior to your arrival. *Booking terms: Please note if cancelled, modified or in case of no show, the total price of the reservation will be charged. *Coupon Code Not Valid For this Rate, It is already discounted. If cancelled up to 30 days before arrival, 35% is charged. If cancelled later, 100% is due. For stays longer than 13days, inquire for staggered payments.